People are now looking at the financial benefits to owning an investment condominium unit which shed light on why more people are jumping on the bandwagon. First off, real estate is a great long-term investment. Although there might be short-term fluctuations in the market, but condo prices will surely increase over time and usually at a greater rate than inflation. Also in having a rental income, it is a great way to pay down your mortgage and build equity. Even if you just break even at first, odds are you’ll end up with a monthly cash flow as the cost of your mortgage goes down and the cost of renting goes up. When shopping around for a new condo, find out who built it. You may not be able to see its worth but this can have a surprising impact on the quality of your investment. Make sure to do a builder background check to ensure your developer has high standards for both quality and design. Look up for professional ratings, check their website, and get opinions from friends and relatives, to mention some. This will help ensure your investment stands the test of time. Italpinas Euroasian Design and Eco-development Corporation (ITPI), an Italian-Filipino joint venture which focuses in sustainable developments, has built its locally- and internationally-acclaimed flagship development, Primavera Residences, in Cagayan de Oro. Find out more about ITPI and Primavera Residences. Buying a new investment unit is about more than just the condo’s price tag. If you find a cheap condo in an undesirable area, you might have trouble finding a renter let alone reselling the place. As a good rule of thumb, only buy a new investment condo that you would be happy to live in yourself. Is it located in a good neighborhood? Is it close to public transportation? Are there good leisure and entertainment areas nearby? Are there decent restaurants near the area? If you answered yes, then you shouldn’t have a problem in renting out your unit. In Cagayan de Oro, the uptown area is still underrated yet considered to be the “Makati City” in Northern Mindanao. According to the Chairman of Multiplata Investments, Lorens Ziller, CdO is well-recognized by those who can afford to live in upper class communities and subdivisions. Uptown Cagayan de Oro is the lifestyle you’ll need if you crave fresh air, flood-free and spacious communities, accessible shopping facilities, little-to-no traffic, and a good view of nature. If you’re considering renting out your condo unit, do everything in your power to ensure you’re handing your unit keys to a tenant you can fully trust. 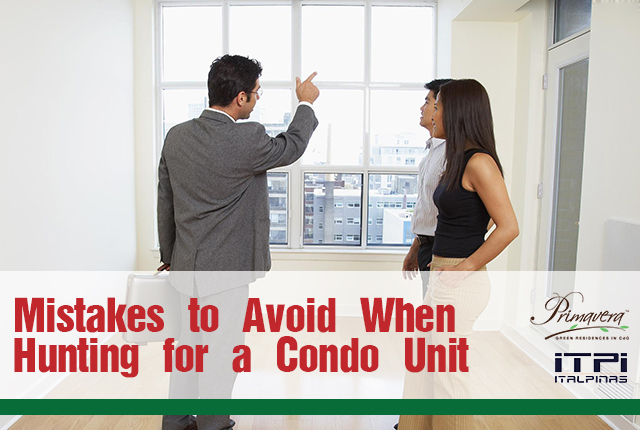 A condo unit is a huge investment after all, and the point is to gain from your investment—not to spend it on unnecessary repairs. Spend time to assess the applicants to the best of your ability through credit checks, quality references from previous landlords, and by meeting them in person. To also protect your investment, it’s a good idea to draft a comprehensive lease agreement that covers for damages, and to request proof of contents insurance prior to allowing renters to move in. The Asset Management Program of Primavera Serviced Residences gives the unit owner the hassle-free handling of their investment. Through this in-house program, your investment will be properly handled by a skilled management team from marketing your investment to eligible tenants up to monitoring your investment for you. Do you want to know more about the project? Click here.